There is a major shift underway in petrol station loyalty, with Tesco Clubcard seeing another major blow. It will hit Virgin Flying Club particularly hard, as they will lose their last branded petrol partner. This follows the withdrawal of Texaco Star Rewards as a Virgin Atlantic transfer partner recently. Avios collectors will also be hit. From June 2019, BP is withdrawing from Nectar. The company is apparently planning to launch a stand-alone loyalty scheme, potentially similar to Shell Drivers Club, although there are no details yet. BP has announced that it will be rolling out more Marks & Spencer Simply Food outlets at its garages, so there are potentially some options to work with the – pretty pathetic – M&S Sparks scheme. At the same time, Esso is withdrawing from Tesco Clubcard. At present, you can earn Clubcard points (which can be converted to Avios or Virgin Flying Club miles) when you buy petrol or in-store items at Esso garages. This Head for Points article explains the complex earning structure. Esso will then join Nectar. This is a little surprising, since Nectar is now wholly owned by Sainsburys and the main Esso retail partner in the UK is …. Tesco. 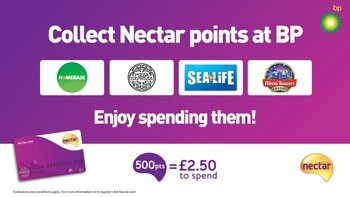 Unless there are plans to replace all of the Tesco stores at Esso garages with Sainsburys outlets, you are going to be in the weird position of being able to earn Nectar points – but not Clubcard points – at Tesco stores in Esso garages! How can I still earn miles from petrol purchases? For Avios collectors – you will need to buy your fuel at a Tesco-branded filling station, where you will be able to earn Clubcard points which can be converted to Avios. You can also fill up at a Shell garage, earn Shell Drivers Club points, and convert those to Avios. For Virgin Flying Club collectors – with the ending of the Texaco partnership, your only option will be to buy your fuel at a Tesco-branded filling station and earn Clubcard points, which can be converted to Virgin Flying Club. Surely a Tesco Express in an Esso petrol station would award Nectar points on fuel and Clubcard points on in-store spend? In Shell at the moment, there is bonus points for precisely ‘landing’ on £30, £40, £50 etc. Should say this is for vPower only. What’s the exchange like on Shell points? If its the same as last time (when it included the now disappeared Fuelsave 95) then you get for more points (500 last time) for putting in £80 of fuel than £50. I’m amazed this promotion hasn’t actually been banned by the Health and Safety Executive as last time I used to take several 10 litre fuel cans down to my local Shell (when it was still price competitive) to hit one of the higher targets (usually 60 litres as 70 and 80 litres required holding too much fuel in the garage and my MR2 Roadster only takes 42 or 43 litres even if I run it as low as I dare). Legally your not allowed to do that as I find out at a Morrisons after using several canisters like you have several times. I agree it does seem dangerous… But van drivers can make it work legally. There is actually no law on how many plastic or metal jerry cans you may fill up at a filling station. See http://www.jerrycans.co.uk/blog/are-jerry-cans-legal-what-is-the-law-on-fuel-cans However many filling stations operate a no more than two cans rule if the station operator actually cares or notices and if he can actually see the side of the car at which you are filling up the cans in the first place. Bottom line is that Shell is the party being irresponsible here by encouraging people with smaller tanks to use such plastic or metal cans to hit their large bonuses for filling with more litres. As the bonuses can’t be earned cumulatively over multiple fill ups it encourages customers to store fuel they would not otherwise store and the policy is also basically unfair and discriminatory to ordinary car owners. However as Shell VPower is a ripoff compared to Tesco 99 and the bonus is not being offered on bog standard Shell 95 Regular Unleaded (now that 95 Fuelsave has vanished in South East England) and Shell pump prices are now generally much higher than nearby supermarkets I no longer have the dilemma of bothering with this promotion. Surely you don’t need the Health andSafety Executive to tell you to stop doing what you know to be wrong. How the heck do I get petrol in my grass mower. Drive on the A road 10mph with my Deer. It got extended. I think to the end of December. 2 Esso points = 1 Avios. So you’re paying 1p per avios compared to using the Esso points for fuel vouchers. The Promotional Period is extended to 2 January 2019 for certain Service Stations, see link on shell web site or posters on forecourts…..
BP and Esso both change their loyalty at the same time and we are supposed to believe they don’t collude! The French seem to have the right idea! Now where is my yellow vest! Wow, that is major collusion. But too late for the EU to fine them several billion Euro. Not really. BP says to Nectar it wishes to withdraw from the scheme, Nectar then asks the other fuel companies if they are interested in joining, and Esso says yes. Yes, this is just a normal Amex limited period offer – available on some cards but not others. The big plus point is that it can be used multiple times. Never had it myself. Shell/BP/Esso all quite a bit more expensive than Tesco/Asda/Sainsbury’s where I am so tend to not really be that bothered about collecting points on fuel and just go for the cheapest! I quite like spending Nectar points on fuel too as rarely shop in-store and find their fuel is better priced than the food! Shell used to offer competitive prices on their fuel when a Tesco superstore petrol station was located within a mile or so of them but now they (Shell) in particular and most of the major fuel brands seem to have given up competing with supermarket fuel prices (this has happened in the last 18 months or so). Having said that I do know of one Esso station that is competing head on price wise with a new Asda petrol station only a mile away from them, even though the Esso station is on a busy main road and the Asda store is at the back of a large housing estate. Shell have also completely lost all of my petrol business due to now never being competitive on price and due to also having withdrawn Fuelsave petrol in favour of bog standard unleaded (same as supermarket fuel – no additives of any kind) at all of its stations within 50 miles of Central London (something to do with lack of additive facilities due to the closure of all the fuel refineries that used to exist on Canvey Island). Bizarrely you can still get Shell Fuelsave almost everywhere else in Europe with no difficulty so I suspect that Shell have also scrapped Fuelsave in much of the UK due to the fierce nature of price competition on ordinary 95 unleaded petrol in the UK caused by the supermarkets. The legacy petrol brands seem to have decided they will make more money from ripping off busy and time poor customers like my sister at 4 or 5p per litre more than Tesco, Asda, Morrison and Sainsbury fuel (or more like 14p per litre more on the motorway) than from selling massive volumes at competitive prices with the supermarkets. As a result of this some supermarket petrol stations are now horribly busy at most peak times to the extent that I have to put in a few litres of branded fuel and then fill up at a supermarket later at a quieter time of day if I need to get fuel in a hurry. Tesco will still offer clubcard points at Tesco stores at fuel stations and at Tesco branded garages. Obviously it will still issue points at Tesco branded garages. No clarity on what happens at Esso garages with a Tesco attached, especially as most people mix fuel payment with their shop payment and in theory are due Nectar and Tesco points. We had Coop and BP combined I swiped both cards for points on each. As Steve says, it’s not uncommon to use 2 different loyalty cards in one transaction. It must be very simple to code the system to give X nectar points for fuel and x tesco points for food. Shame as Esso was my nearest source of clubcard points on petrol spend. TBH using Morrison’s is far cheaper and still accepts amex so its not so bad. My nearest garage has been Esso for years. It was always a bit more expensive than Morrisons, Asda or Tesco, but two years ago the owners sold out to EuroGarages who knocked the whole thing down, built a much bigger forecourr, added Starbucks and Subway, and increased prices for fuel massively, so they are typically 8p or 9p per litre more than the supermarkets. I have never bought fuel there since, but they do seem to be one of very few Esso stations that give Clubcard points on newspapers and other non fuel items. If you don’t have it already, get the Esso app. You’ll get 200 bonus points for the first £30 spend and 5th £30 spend. Sounds like you should start this now before the whole Clubcard points thing goes away. Oh and also, (this maybe targetted), link your PayPal account to esso app and get £5 back on one time £50 spend on the esso app paid with PayPal. This works in conjunction with the above. I did report this to HFP but it clearly wasn’t newsworthy. And I think the PayPal deal is £5 back on £10+ spend? Was a bit fiddly to load up and set up in the app, but worked a treat. I topped up £10 exactly and was charged £5. Too true on the M&S Sparks comment……I still dont really know why I bother with the scheme – the points dont really seem to mean much – other than being able to check your app to see if they have given you any decent usable(for you) vouchers – so far, mine have been rather feeble and pathetic and waay too time limited. I entirely agree on M&S Sparks. I handed my card back about a month after getting it, telling the CS desk it was useless. Do not shop there much anyway – too expensive for many things – and when a checkout person asks for my Sparks card I tell them why I no longer have one. I do not suppose that my comments get through to anyone of significance though! There is a reason why I have never seen it mentioned on Shopper Points, I suspect! It’s only good for the priority access to sales stuff and for occasional 20% off offers (occasionally stackable). Largely a waste of breath telling a cashier something like that really. When I used to work in a supermarket, at best your “type” would get a silent internal groan (“why on Earth does he think I remotely care that he doesn’t like a loyalty scheme that has nothing whatsoever to do with me?”) and at worst you’d be mocked behind your back. Priority access to 50% off in sale, stock is normally gone by the time everyone gets access and sometimes discount isn’t as good! Indeed. I used it because they said they will support a charity but I’m not carying a card for once in a month shopping. Currently running Amex Plat (Already upgraded from Gold) and BAPP. Have hit the spend target for the 241 vouncher and referred the OH for her own BAPP and supp card. Is the next logical step to cancel *my* BAPP to trigger the 6mth period (since I can use any Amex to pay the taxes on the 241) and self-refer for the Amex Gold Credit card? Why not refer your OH for the gold cc from your plat, and get 18k MRs. Hope you did, the referral from your plat for the OH bapp! So,yes,you can cancel your bapp and start your new 6 mths wait. Keep a spreadsheet of start and cancel,dates tho, and always make sure one of you is spending towards a target. And on a 6 mths rotation. Are you planning to keep the plat or rotate it? Plus when you refer for new card, wait a couple of weeks to add the 1st supplementary. Get 5k for plat, 3k for bapp, 2k for gold. Thanks, she already has a gold charge, trying to convince her to run the Plat upgrade before cancelling. Planning on keeping the Plat with a supp and splitting the fee (pays back in lounge fees alone). Will kick off a spreadsheet (Dont suppose you have a template, save me re-inventing the wheel? ), and am currently spending towards OH’s 241. Try your hardest to make sure she does the upgrade – it’s probably the last chance she’ll have to get free Plat (assuming they don’t charge for plat until the anniversary of gold charge). If she signs up asap, she can refer you to Gold CC before end of the year, and get herself 18k MR, then the ’90k points for referrals per year limit’ resets on Jan 1st. I’d encourage you to develop your own spreadsheet based on your own “appetite” for using Amex. I’m just a bit of a geek and want to model different scenarios and also know exactly how much I’m actually paying for those avios (0.04p at latest check). Esso sites, whether independently owned or as part of a group (MFG, MRH, Eurogarges etc) pay for every point given out. Monthly bills can be pretty substantial. The new “deal” Tesco wanted to negotiate was unsustainable and with Tesco becoming more and more protective over the Clubcard usage, it was time to change.